Ateneo de Maninal University students developed and created Tidy Heidi, an instant stain remover that is non-toxic and color safe. It was because of an incidence when one of them spilled coffee on herself. These are chemical engineering students who had to start a business model as part of their curriculum at the Ateneo School of Management Business Accelerator (SOMBA) program. The chemical engineering students were tasked to start a business as part of the curriculum under the Ateneo School of Management Business Accelerator (SOMBA) program. Naming the product Tidy Heidy, after the mother of one the group members, Page Sy. “’Yung negosyo namin, part siya ng curriculum, bahagi nun ay gagawa kami ng negosyo, pupunta kami mismo sa BIR [Bureau of Internal Revenue] at magse-set up kami ng corporate account sa bangko,” Sy told "My Puhunan." With consulations with their chemistry professor, they developed the formula for mixing bleach and surfactants. “Pinuntahan namin ‘yung professor namin sa chemistry, tinuro niya sa amin ‘yung basic na concept tapos simula nun, nag-try kami ng iba-ibang chemicals at kami na din ang nag-formulate,” shared Sy. Research, development, and marketing was undertaken with a seed capital of only Php130,000.00 for Tidy Heidy. It was important for them to distinguish their product from known industrial stain removers, thus, Tidy Heidy is packaged as a hip brand and is environmentally friendly. "‘Yung pinaka-unique sa amin ay gusto namin ipakita ay safe at effective kami. Kapag tinignan mo ‘yung packaging namin, hindi kami ‘yung parang industrial-looking na nakakatakot tignan. 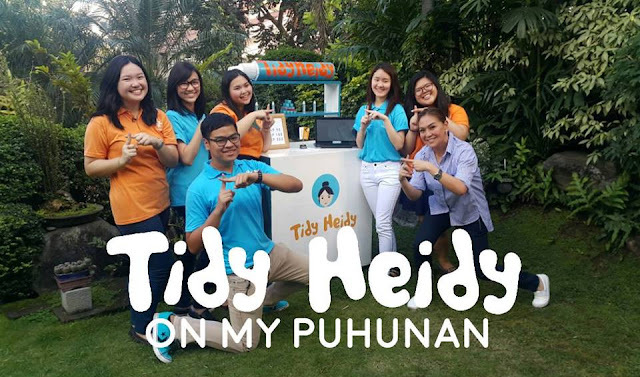 Ang gusto talaga namin i-portray ay ‘yung pagka-playfulness at pagka-safe niya,” said Katrina Echon, one of the co-founders of Tidy Heidy. The product is sold for Php95.00 in 19 ml bottle droppers and can remove fruit stains, beverage stains, wine stains and non-greasy food stains. They have sold more than 1,800 bottles since July 2015 via their online store and by joining bazaars.